Based on Richard Mathesons Science Fiction Classic 'I am Legend' and later made as the Movie 'The Omega Man' and recently, the Movie 'I am Legend'. 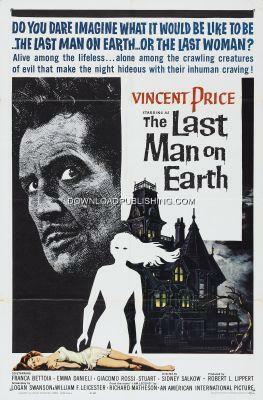 This Classic stars Vincent Price as Scientist Robert Morgan in a post apocalyptic world. The people of the world have been infected with a plague that has transformed them into ravenous vampires. Seemingly Morgan is the only human not affected by the plague and becomes a lone vampire slayer.